Often, the most frustrating part of crafting the perfect dinner is feeling like you have to clean every single pot and pan in your kitchen after cooking just one meal. With so many components, it can feel like each step of a single dish requires its very own pot. Yet there are certain steps that can be combined, or even skipped altogether. And that's where casseroles come in. If you're whipping up a creamy, liquid-filled casserole that calls for rice, don't bother cooking it separately in its own vessel. Instead, cook your rice in the baking dish, and you'll create fluffier, creamier, and more flavorful rice dishes with less effort. Win-win, right? In a large number of instances, recipes that call for rice mean boiling two cups of water for every one cup of rice, then adding the fluffy rice to the rest of the ingredients. However, according to Lindsay Funston of Delish, carefully portioned water isn't the only liquid that can cook rice—the grain can cook in some surprising liquids, such as broths, sauces, and casserole bases, and you don't need to place it in its own special pot. Cook the meat and any seasonings together in one large pan. Once those have reached the level of "doneness" specified by your recipe, add in your uncooked rice. Pour in the liquids. Whether it's water, broth, milk, or any other liquid, add all of the wet ingredients on top of the meat and rice. Use the amounts recommended by your recipe; you don't need to worry about the traditional rice ratio. As long as the liquid covers the rice in your pan, it'll cook. Stir every few minutes—Funston suggests every 5 minutes—and allow the rice to soak up the hot liquid just as it would boiling water. 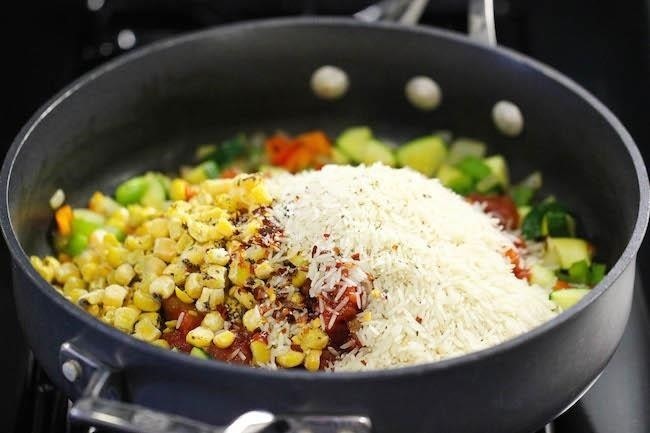 Once your rice is cooked through and fluffy, go ahead and add the final ingredients of your casserole (cheese, breadcrumbs, veggies... whatever else you need or want). One potential problem that can arise from the one-pan rice cooking method is a liquid imbalance. Casseroles can become either too wet and soggy, or unpleasantly dry. In order to keep your dish and your rice perfectly gooey and fluffy, Julie Christensen at Our Everyday Life offers a few tips on how to cook different types of rice in a single pan. Instant rice is parboiled, or precooked, so that it cooks quickly no matter the liquid you use. When used in a casserole, it should cook within 30 to 40 minutes. Traditional white rice—not the minute variety—takes a bit longer at 50 to 60 minutes. If you're using brown rice, be prepared to cook your dish for more than an hour; this variety often takes longer than white rice, so watch the liquid level in your dish and make sure it's soaking up as much as it needs. Wild rice is similar to brown rice, and typically requires over an hour when baked in the oven. If you find that your rice is perfectly cooked but your casserole is soggy, during the last few minutes of cooking try removing any lid or foil cover to allow that excess liquid to cook off for a few minutes. 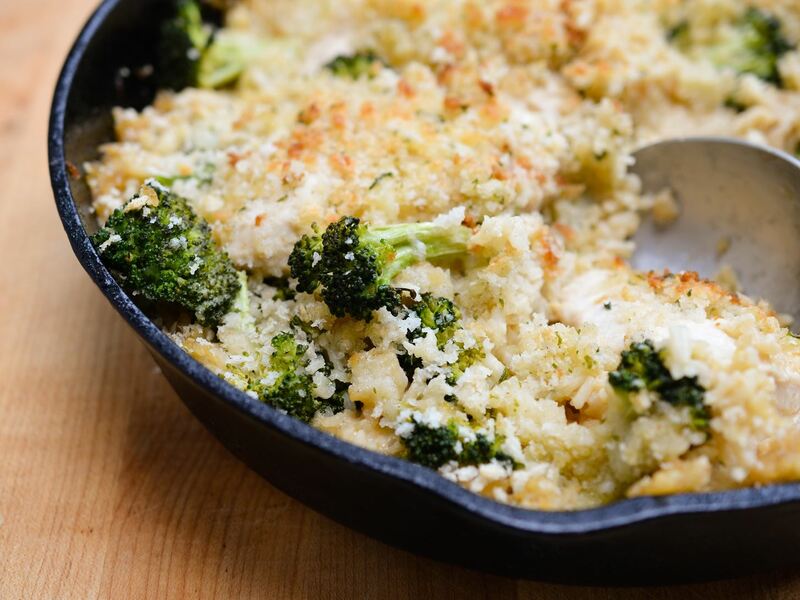 When facing the opposite problem—a crispy, crunchy, too-dry casserole—stir in more liquid, and allow it to heat through. Once your casserole or dish is at the perfect consistency, you can savor your delicious meal without worrying about any extra pots piling up in the sink. Any hack that keeps you from having to do extra dishes is a good one, right?